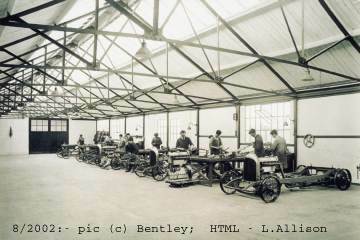 1919 Walter Owen 'W O' Bentley opened a London office to design and build sporting cars. Exhibition chassis shown at the London Motor Show. "W O Bentley proudly unveiled the new 3-litre car bearing his name on Stand 126 at the 1919 Olympia Motor Exhibition, the prototype engine having fired up for the first time just a few weeks earlier. Bentley's four-cylinder 'fixed head' engine incorporated a single overhead camshaft, four-valves per cylinder and a bore/stroke of 80x149mm" — Bonhams. 1921 The first Bentley model, the '3-litre', 2996cc, 4-cylinder, 4-valves per cylinder, sohc, bore of 80mm and stroke of 149mm, was built in Cricklewood. 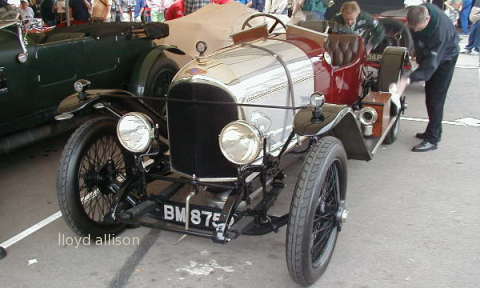 A 1921 production 3-litre Bentley, chassis #3, sold for us$962,500 at Gooding Co's Aug. 2011 Pebble Beach auction. Noel Van Raalte, Bentley's very first customer, originally bought the car (reg. AX 3827) for £1,150 — B. 1925 A 6597cc, 6-cylinder model was introduced to handle larger and heavier bodywork. 1925-1927: Eighteen 100mph Supersports Bentley 3-litres produced. 1927 The 4-cylinder engine was enlarged to 4398cc, nominally 4.5-litres, using the pistons of the 6. 1927-1930 Bentley won the Le Mans 24-hours race four years in a row. 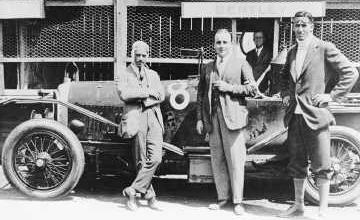 1929 A supercharged 4.5-litre car was developed for Birkin to race; there was a limited production run of 50 to make this model eligible for racing. It is said that W.O.Bentley did not approve of supercharging. 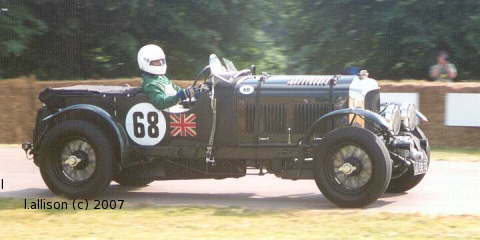 1930 A 7983cc, 6-cylinder Bentley was released in late 1930, a fast touring car rather than a strict sports car. It was not a good time to be producing such an expensive car. 1931 The Depression hit Bentley sales and the company went into liquidation. A bid by Napier to acquire Bentley was beaten by Rolls-Royce. Bentley production moved to Derby. W O remained with the company as a consultant. 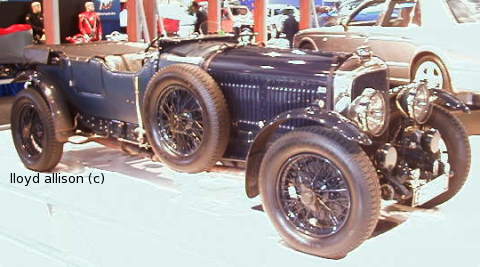 W.O.Bentley later joined Lagonda. 1946 Production moved from Derby to Crewe. The first car built there was a Bentley Mark VI. 1952 R Type and Continental (2-door, 4-seat) variant launched. 1955 Bentley S1, first new car built and engineered at Crewe. 1959 The 6.25-litre V8 S2 replaced the 6-cyl. S1. 1965 The monocoque Bentley T series introduced. 1971 W O Bentley died. 1971 Rolls-Royce suffered crippling losses following technical problems with RB211 jet engine. The Government rescue plan split the aerospace and automotive divisions; rights to Rolls-Royce trademark stayed with Rolls-Royce Plc.. Rights to the Rolls-Royce grille and the Spirit of Ecstasy belong to Rolls-Royce Motor Cars. Rolls-Royce Motor Cars licensed its name from Rolls-Royce Plc..
1980 Rolls-Royce Motor Cars was acquired by Vickers Plc, a defence and engineering corporation. 1991 Vickers discussed sale of Rolls-Royce Motor Cars. 1992 Rolls-Royce Motor Cars contracted with BMW for supply of air bag systems. 1993 Rolls-Royce was in discussions with Mercedes-Benz on engine supply. 1994 BMW and Rolls-Royce reached an agreement for BMW to develop engines for the new line of Rolls-Royce and Bentley cars. 1997 Oct Vickers Plc put Rolls-Royce Motor Cars up for sale. BMW, in an aviation engine joint venture with Rolls-Royce Plc since 1990, was considered the most likely buyer. 1998 Apr, Vickers Plc formally accepted a £340 million takeover offer by BMW. VW AG announced a better offer. 1998 June VW AG agreed to pay Vickers Plc £430 million for Rolls-Royce Motor Cars including Bentley Motors subject to shareholder approval. VW also agreed to acquire Cosworth Engineering from Vickers Plc for an additional £120 million. Volkswagen AG announced a £500 million product development investment programme for Bentley Motors at Crewe. 1998 July Agreement was reached as follows: BMW acquired the Rolls-Royce name and logo from Rolls-Royce Plc for £40 million and licensed VW AG to use the name to the end of December 2002. 1998 Launch of the Bentley Arnage Green Label & the Rolls-Royce Silver Seraph. 1999 Launch of the Bentley Arnage Red Label. Bentley Motors announced a decision to launch a new car, codenamed MSB, the first of which was later confirmed as a GT coupe. 2000 Jan New Rolls-Royce Corniche in Los Angeles. 2000 Mar New Rolls-Royce Park Ward launched at Geneva Motor Show. 2001 Bentley returned to Le Mans and took third place overall. 2001 Last of the line series models for Rolls-Royce Silver Seraph announced. 2002 Last of the line series models for Corniche and Park Ward announced. 2002 Last ever "real" Rolls-Royce (a Corniche) was presented to the press on August 30th at the Crewe factory. 2002, September 16: "... the company that builds Bentleys will once more be known as Bentley Motors Limited, the name bestowed by founder, Walter Owen Bentley (WO) in 1919. The title has not been used since the business went into liquidation in 1931." 2003 January 1: BMW AG assumed the rights to the use of the Rolls-Royce marque. 2003: A Bentley Speed-8 (#7, Capello, Smith & Kristensen) won at Le Mans. 2007: 10,014 Bentleys were sold worldwide in 2007.